Currently, most anaesthetic data is recorded manually using paper forms. It’s time consuming, inefficient, often frustrating and creates issues “downstream”. Data just isn’t portable, can be hard to access, isn’t secure and can’t be put to other purposes. Synopsis Touch is the solution. From the makers of the renowned Recall AIMS charting system, Synopsis Touch is the ultra-modern approach. Using the insight and experience from anaesthetists across the globe, Synopsis Touch represents a step-change in digital charting. Synopsis Touch is a mobile AIMS that allows anaesthetists to use an tablet to enter and review information anywhere, not just in the Operating room. Synopsis Touch replaces the paper record. It is an all-new solution to automated charting from the company that has been building AIMS systems since 1991. Synopsis Touch is a full-featured, scalable, easy to use AIMS that works on an iPad and touchscreen Windows workstation. Easy to read and to use, it frees you up to focus on patient care. The system communicates directly with your anaesthetic machines, monitors, infusion pumps and other medical devices to automatically chart the patient. Synopsis Touch delivers an incredibly detailed and accurate chart, ready for a range of uses. Only a few elements of the chart, such as events, infusions and annotations, need to be entered manually. Synopsis Touch takes care of the rest, automatically charting in fine detail. The outcome is an incredibly detailed chart, with nothing missing, and a vital part of the medico-legal record. In addition, Synopsis Touch will readily share information with other hospital IT systems. You can use the data for reporting, governance, training, research, improvement… the list goes on. For example, it was shown that a hospital department might reduce its drug expenditure in-year by 50% through the implementation of an Electronic Anaesthetic Record. In addition, providers can benefit from added value such as CQUIN pre-qualification using the event and monitoring record-keeping capabilities of the Synopsis system. With over 22 years’ experience in AIMS, we will help to design and evidence the business case with you. 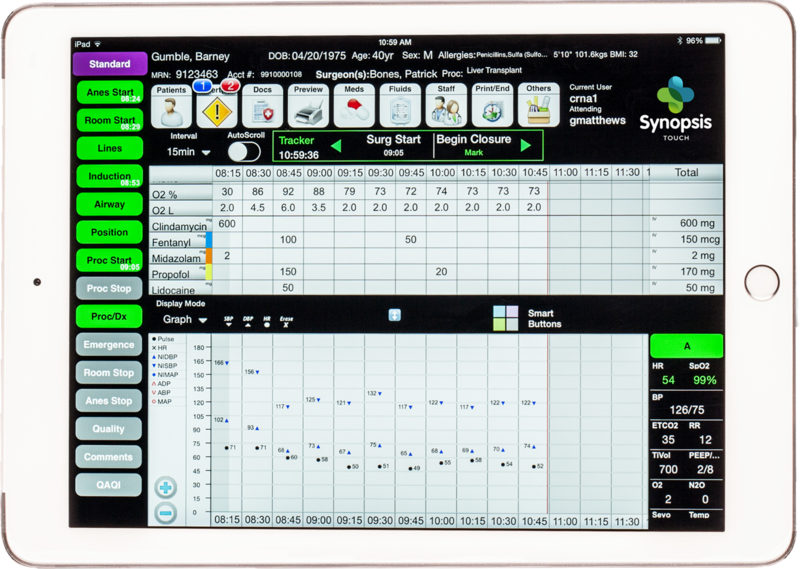 Synopsis Touch is fully integrated with Synopsis iQ pre-operative assessment. Alerts, allergies, history, meds etc. all available onscreen. You and your patients benefit from the seamless approach to the preparation for anaesthesia and the procedure itself. Building on the widely used and respected Recall AIMS, Synopsis Touch takes the best of clinically proven anaesthetic information management systems and enhances the offer with next generation technologies and the incorporation of international clinical coding standards. Synopsis Touch is a step-change in integrated anaesthetic information management systems (AIMS). Using Synopsis is easy, non-distracting and ensures that a comprehensive, reliable and structured record is kept. Continually refined by anaesthetists, and based on 22 years experience. Attention is drawn to allergies, preoperative tests, airway issues, family history etc. Synopsis Touch gathers information from your patient monitors in real-time. Physiological values are collected directly from anaesthetic machines, patient monitors and other devices attached to the patient, collated into trends and displayed on screen. Pre-configured drugs (including dosage/units/administration route), anaesthetic methods and all clinical procedures, are recorded with ease. Following the anaesthesia, Synopsis Touch produces a detailed anaesthetic chart and medico-legal record. Should hospital network issues occur, Synopsis Touch automatically saves your case files both locally and centrally ensuring nothing is lost. Even in the case of server failure, Synopsis Touch continues your case uninterrupted. Once the network is restored, Synopsis Touch automatically synchronises with the server, ensuring the case is available throughout the hospital as soon as possible. A printed copy of your case can be produced immediately, regardless of the state of the network. Synopsis Touch is also compatible with popular reporting tools like Crystal Reports and Cognos Impromptu. On installation, Synopsis Touch will include your preferred reports, with total freedom to create custom reports at any time thereafter.